Dragon Quest III Soshite Densetsu e… (ドラゴンクエストIII そして伝説へ…, Dragon Quest III Soshite Densetsu e…? lit. Dragon Quest III: And thus into Legend…) was localized outside Japan as Dragon Warrior III. It's a role-playing video game developed by Chunsoft and published by Enix (now Square Enix). It is the third installment in the Dragon Quest series (known as Dragon Warrior in North America at the time of its original release), first released for the Famicom in Japan, and then the NES in North America. The game later was ported as an enhanced remake on the Super Nintendo in late 1996 and then on the Game Boy Color in 2001. This game was never released in Europe. This is the final game in the Erdrick trilogy and is the first chronologically. The story follows the traditional Dragon Quest Hero, who is on an adventure to save the world from evil. Putting together a party of assorted classes, the Hero must travel the world, stopping at various towns and other locations, eventually making his or her way to the Demon Lord Baramos's lair. While the combat system remains close to the previous Dragon Quest games, keeping battles turn-based and in first-person, Dragon Warrior III expanded on the open world and nonlinear gameplay of its predecessors, and introduced innovations such as a persistent world with its own day-night cycle, and a class-changing system inspired by Wizardry, which is later seen in Dragon Quest VI, Dragon Warrior VII, and Dragon Quest IX. This class system allows the player to customize his or her party by changing character classes during the game, and keep a character's stats and skills learned from previous classes. 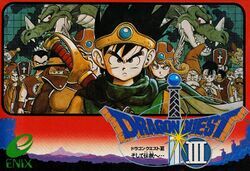 Dragon Quest III's class-changing system influenced future Japanese RPGs, especially the Final Fantasy series. Dragon Warrior III follows the adventures of the son (or daughter) of Ortega, a valiant warrior who fell trying to defeat the Archfiend, Baramos. On the hero's sixteenth birthday, the King of Aliahan sends you out on a journey to finish what your father started. The hero and his three companions will travel across, over, and under the entire world, save two lands from evil, and become legends. NOTE: the original Japanese NES title screen is just Dragon Quest III in white letters on a black screen. Note that the original title is Dragon Quest III: And thus into Legend... (literal translation from Japanese). 1988 NES Localized as Dragon Warrior III. 1996 SNES Japan only; it includes an extra dungeon (Sky World), the Small Medals sub-quest and five Pachisi Tracks. 2000 GBC Localized as Dragon Warrior III; it includes another extra dungeon (Ice Cave). 2011 Wii Japan only; part of Dragon Quest 25th Anniversary Collection. 2014 Phones Localized as Dragon Quest III: The Seeds of Salvation. This page was last edited on 11 November 2018, at 22:06. This page has been accessed 192,014 times.